Students can consider the option of a MSW thesis. The option of a thesis is available for up to three MSW students in an academic year. Students will be approved for a thesis based on meeting the above eligibility criteria, and based on: 1) the quality of the applicant’s proposed research, and 2) the availability of a supervisor. Students who undertake a thesis typically require 1-2 extra semesters to complete the process and, therefore, may need to pay additional tuition fees. There are other options available for gaining research proficiency, including taking additional research courses, seeking an independent study experience with a FIFSW faculty member, seeking courses at other faculties and choosing a research intensive field placement. We encourage students to discuss all these options with their faculty advisors. If you have any questions about this process, please contact the Associate Dean of Research, Barbara Fallon (barbara.fallon@utoronto.ca). Once the thesis proposal has been approved, (see Appendix A, Approval for MSW Thesis Commencement Form), the student, in consultation with the supervisor, selects other members for the thesis committee. Committee members are chosen on the basis of their known expertise in the student’s area of research. Committee members may be selected to contribute to the substantive area of the thesis or to contribute methodological expertise. One member is often the second reader of the thesis proposal. A member can also be chosen from outside the Faculty (for example, a field instructor or a leading practitioner in the field). It is possible to appoint a committee member from another university who has similar graduate faculty status at her/his university. Note: It is not a requirement that all committee members be members of the SGS at University of Toronto. If the student is enrolled in a collaborative specialization, the thesis will be supervised and evaluated in the same manner as those in the home graduate unit. Normally, at least one graduate faculty member affiliated with the collaborative specialization will be a member of the student’s thesis committee. It is recommended that the thesis committee consist of at least 2 working members. At a minimum, the thesis committee should consist of the supervisor plus at least one other member. The size and composition of the committee should ensure reasonable support for the student during all stages of development and completion of the thesis. Note: The final oral examination requires a quorum of three voting members. For the oral examination, one or more examiners join thesis committee member(s) to conduct the exam. A final target of four members for the oral examination committee ensures that the quorum of three voting members will be met should unforeseen circumstances require a member to be absent. When all thesis committee members have been selected and have agreed to serve, the student completes the “Thesis Committee Member Form” (Appendix B), and submits a copy to the Associate Dean of Research for subsequent placement in the student’s file. The supervisor (the thesis committee chairperson) and thesis committee provide support and guidance throughout the thesis process. They initially approve the thesis and at least one will be present at the defense. The committee should meet at regular intervals during the research process. It is important that the student keep both the supervisor and the thesis committee informed of her/his progress. The student should come to meetings prepared to discuss progress and problems with the thesis research. The committee members will provide consultation, suggestions, and specific recommendations for dealing with the problems. Committee members will assess drafts of the chapters of the thesis and provide feedback within two weeks. They will also evaluate the final draft of the thesis and provide specific feedback as to the revisions needed prior to the oral defense. Depending on the nature of the data required, the student may need three or more months to complete data collection. Data analyses and writing of the thesis often requires an additional six or more months. According to this schedule nine or more months will be required to complete the thesis. This time line is based on concentrated work on the thesis with only minimal employment responsibilities. If the proposed research involves the use of human subjects, an application and protocols must be submitted for delegated (expedited) or full review, to Health Sciences REB. Students should refer to the website, http://www.research.utoronto.ca/about/boards-and-committees/research-ethics-boards-reb/, for application forms, regulations, policies and guidelines governing human research, dates of upcoming meetings of the Health Sciences REB and deadlines for submissions of protocols (usually 2 weeks prior to meeting dates). The REB now accepts electronic submissions exclusively by email (no need to hand in hard copies), for both delegated and full REB reviews for all REBs. Please e-mail one electronic copy of your protocol and appendices as a single Word document or a pdf, with appendices pasted in at the end to new.ethics.protocols@utoronto.ca. Electronic signatures are preferred. The Research Coordinator (Room 516) of the Faculty’s research office may also be contacted for help. The above website also offers other important information on topics such as “informed consent” and “delegated/expedited review”. Informed consent requirements are discussed and sample forms are shown. Studies that may qualify for delegated/expedited review due to minimal risk are also discussed. The format for the title page, acknowledgments, abstract, and table of contents is consistent with a standard set by the University. In general, the content of the abstract should give an overall picture of the thesis and should include: purpose of the study, its focus, and research questions or hypotheses; theoretical framework; source of data; methodology; major findings; limitations and strengths; and implications. The supervisor (the thesis committee chairperson) and student, in consultation with the Associate Dean of Research, determine the composition of the oral defense examination committee. The examination committee consists of at least three and as many as five voting members. The quorum is three voting members. The examiners will require sufficient knowledge of the content of the thesis to form a judgment about its acceptability. • a non-voting chair appointed by the Associate Dean of Research. All examination committee members must receive copies of the thesis at least four weeks in advance of the examination date with the exception of the external reviewer who must receive a copy six weeks in advance (see below). It is the student’s responsibility to distribute copies to the external reviewer and the committee members. The external reviewer must have an arms-length relationship with the student and the supervisor and is selected by the thesis supervisor and the student in consultation with the Associate Dean of Research. The reviewer/appraiser completes a written assessment of the thesis, recommends acceptance or lack of acceptance and normally participates on the oral examination committee as an examiner. Thesis appraisals usually consist of an analytical and constructively critical commentary of the thesis, together with an assessment of the importance of the work in relation to the field. The appraisal ends with an explicit recommendation that the thesis either be accepted or not be accepted in partial fulfillment of the requirements for the degree of Master of Social Work. The typical length is one to two pages, single-spaced with a list of minor errors attached. The external reviewer should have a minimum of four weeks to review the thesis and prepare a response. In turn, the student and all members of the examination committee are entitled to see the appraisal two weeks before the examination takes place. Therefore, the thesis must be given to the external appraiser six weeks prior to the defense date. The student can use the two weeks to prepare a considered response to the appraisal. However, the student is prohibited from discussing the appraisal with the external examiner until the examination is underway. When the members of the examination committee and the external appraiser have been confirmed, the student and supervisor can determine a defense date and time. At this point the student can formally notify the Factor-Inwentash Faculty of Social Work of her/his intent to defend the thesis at an oral examination. To make this request, the student should complete the “MSW Oral Defense Request” form (see Appendix C) and return it to the office of the Associate Dean of Research. The form is for the internal use of the faculty and includes information needed by the faculty to commence with the defense planning, including the defense date and time, committee composition, AV needs, thesis abstract and a short author’s biography. The form should be submitted four weeks prior to the defense date. Planning for the thesis defense should take into account the School of Graduate Studies deadlines for convocation and fees. Approximate deadlines for defense are March 31, June 30, and December 18. In order to arrange for a defense, the thesis must be ready at least six weeks prior to these dates. Please note that difficulties in defense scheduling may be compounded by holiday schedules. For instance, the last day to defend for the November convocation is the end of June due to the summer schedule of committee members. However, with the approval of committee members and the Associate Dean of Research, this defense may be held at a later date. The MSW oral examination should generally follow the established School of Graduate Studies procedures for Ph.D. final oral examinations. Many of these procedures are relevant for the MSW oral examination, which is conducted by the Factor-Inwentash Faculty of Social Work. At the examination, the chairperson functions to protect the candidate from harassment, ensure the candidate is given reasonable opportunity to defend the thesis, and to ensure the candidate her/himself defends the thesis (not the supervisor or other committee member). Examination committee members must vote whether or not the thesis and the defense are acceptable or not acceptable. More than one negative vote causes the thesis examination to be adjourned. Members who find the thesis acceptable must also determine whether the thesis is acceptable as is, requires minor corrections, or requires minor modifications. Minor corrections are punctuation or typographical errors or problems in style. Normally these issues must be correctable within one month. The supervisor informs the candidate of the necessary changes and provides a written statement to the Associate Dean of Research when the corrections have been completed. Minor modifications are more than changes in style and less than major changes in the thesis. A typical example of a minor modification is clarification of textual material or the qualification of research findings or conclusions. Minor modifications should be feasibly completed within three months. The committee member in charge of monitoring the changes (usually the supervisor) provides a brief written statement of the necessary changes to the candidate and Associate Dean of Research. When the modifications are complete, they notify the Associate Dean of Research in writing. All corrections and formatting of the thesis must be completed prior to the last day for degree recommendation (see Table 1., page 19 and the SGS Calendar) so that the candidate can be recommended for convocation. The corrected final approved thesis must be electronically submitted to SGS by the deadline or the student will be required to register and pay fees until the thesis is completed. The chairperson immediately returns all exam forms for the student’s file to the Registrar’s office. Student makes modifications to the thesis as required. These are reviewed by the faculty member(s) designated at the end of the oral defense (usually the supervisor). Minor corrections are completed within one month or less while minor modifications are completed within three months or less. Supervisor informs the Associate Dean of Research in writing that the student has made revisions/corrections (see Voting Ballot and Chair’s Summary Form in Appendix D). o Library release guidelines (The University of Toronto Authority to Distribute Form). o Request for microfilm (National Library of Canada Non-exclusive License to Reproduce Theses). o Students failing to complete all steps by the specified deadlines will be required to register and pay fees for another term. 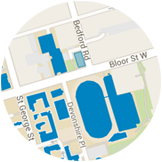 One electronic copy of the final approved version of the defended thesis must be submitted to SGS through T-Space (https://tspace.library.utoronto.ca), the digital research repository for the University of Toronto community. All theses will be submitted to the national thesis program at Lirbary and Archives Canada, and theses will be made publicly available on the Theses Canada Portal. This program makes theses available to ProQuest, which in turn makes theses available for purchase on its Proquest Dissertations & Theses Database and includes the catalogue records in its bibliographic services. It is the intention of the University of Toronto that there will be no restriction on the distribution and publication of theses. However, in exceptional cases, the author, in consultation with the thesis supervisor and with the approval of the chair of the graduate unit, shall have the right to postpone distribution and publication for a period of up to two years from the date of acceptance of the thesis. In exceptional circumstances and on written petition to the Dean of the School of Graduate Studies the period might be extended, but in no case for more than five years from the date of acceptance of the thesis, unless approved by the Graduate Education Council. Following electronic submission of the thesis, a signed hard copy of the Library and Archives Canada Theses Non-exclusive License form (available online at www.collectionscanada.gc.ca/thesescanada), along with any necessary copyright permissions, must also be submitted to SGS. Candidates will be charged a fee for the processing and indexing of the thesis. Students should consult their graduate unit for additional local format requirements, submission deadlines and procedures concerning master’s theses. An electronic copy of the thesis must be submitted to the School of Graduate Studies only after the thesis has been successfully defended and any final corrections have been made. The School of Graduate Studies also requires a copy of the letter from the student’s supervisor confirming completion of any required corrections. Students may also be required to submit a bound copy or copies of the thesis to the relevant graduate unit. Students must notify the Office of Convocation of their intent to attend convocation after the Faculty Assessment Committee has approved students to graduate. Visit the convocation website: http://www.convocation.utoronto.ca/ for details.